Hope everyone had a wonderful start to their week! I’m so excited to share my new LBD with you. This dress is currently ON SALE at Target AND it comes with pockets AND it’s off the shoulder. GAH! I adore it and it is definitely going to be a staple piece. It is essentially the same as the cold shoulder top I got but in dress form. I envision so many different ways to wear this dress. This casual look was actually what I wore to a job interview (which I got by the way!). I’m really loving the color combo of honey/cognac paired with black. Hence the reason I wore this hat along with sun protection during my commute. I think it looks chic with a touch of earthy. 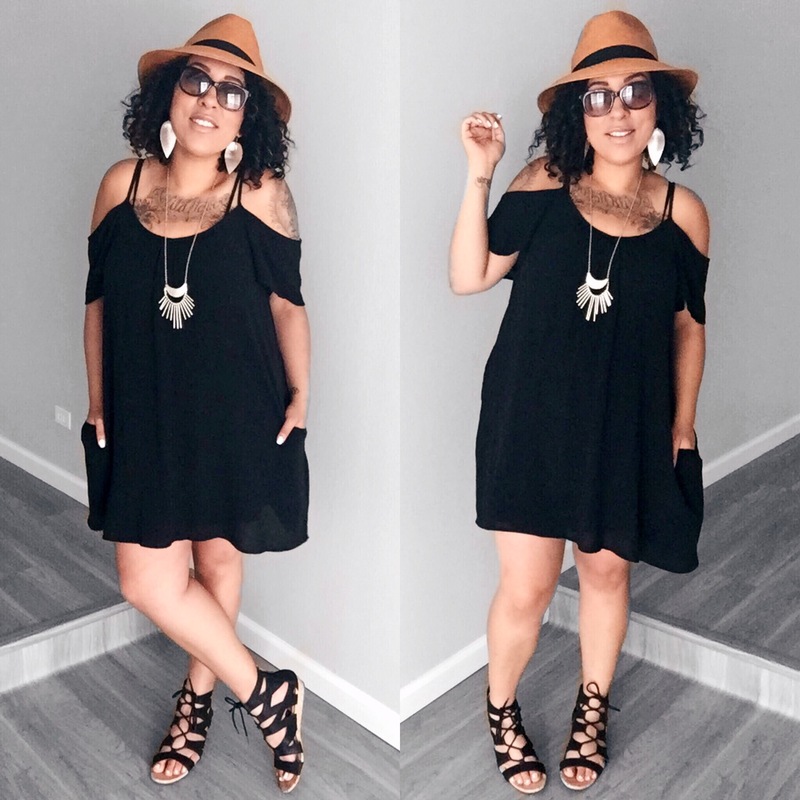 These gladiator sandals really helped break the outfit up with the contrast of my skin tone against them. I think had I gone with a more natural color it wouldn’t have looked as good. Typically I would have went with gold jewelry, but again I was really diggin’ the contrast of the silver. I am OBSESSED with these Raven & Lily earrings and have them in silver and gold. They seriously go with almost everything I own. Let me know if you have any great outfit ideas for this dress! Previous PostPrevious Weekend: Party on….